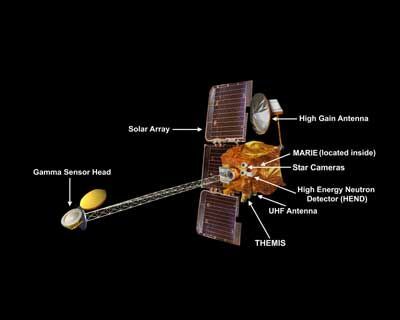 NASA's Mars Odyssey spacecraft deployed its high-gain communications antenna last night, marking a major technical milestone prior to the beginning of the science mapping mission. At 7:29 p.m. Pacific Time, Tuesday, Feb. 5, mission controllers monitored changes in the radio signal from Odyssey, indicating that the release and deployment of the antenna boom were proceeding as planned. The antenna boom was deployed to its latched position with a motor-driven hinge and locked into place as expected. The antenna's position is controlled with a two-axis gimbal assembly that allows the spacecraft to communicate with Earth while the science instruments are simultaneously collecting data of Mars. Overnight, flight controllers checked out the gimbals, which allow the antenna to be pointed in a variety of positions to track Earth. "Successful deployment of the high gain antenna paves the way for Odyssey to achieve the real payoff of the mission, the science data return," said David A. Spencer, Odyssey's mission manager at NASA's Jet Propulsion Laboratory, Pasadena, Calif. The science instruments are expected to begin collecting data later this month. Flight controllers first need to test the mapping orientation of the spacecraft, in which the instruments are pointed at Mars while the antenna tracks Earth. The high-gain antenna is 1.3 meters (4.3 feet) in diameter, with a parabolic shape. The antenna can transmit at data rates as high as 110 thousand bits per second. JPL manages the 2001 Mars Odyssey mission for NASA's Office of Space Science, Washington, D.C. Principal investigators at Arizona State University in Tempe, the University of Arizona in Tucson, and NASA's Johnson Space Center, Houston, Texas, operate the science instruments. Additional science investigators are located at the Russian Space Research Institute and Los Alamos National Laboratories, New Mexico. Lockheed Martin Astronautics, Denver, Colo., is the prime contractor for the project, and developed and built the orbiter. Mission operations are conducted jointly from Lockheed Martin and from JPL, a division of the California Institute of Technology in Pasadena.